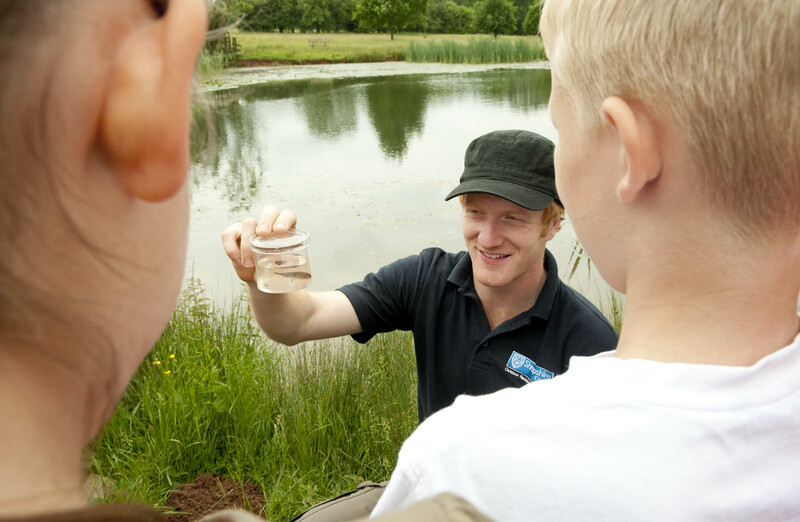 Geopark visitor centres have a host of special events on offer over the Easter holidays. If you’re looking for trails Bodenham Arboretum have an Easter trail for children to search for carrots all the way to Mr McGregor’s garden, whilst meeting spring lambs and calves. 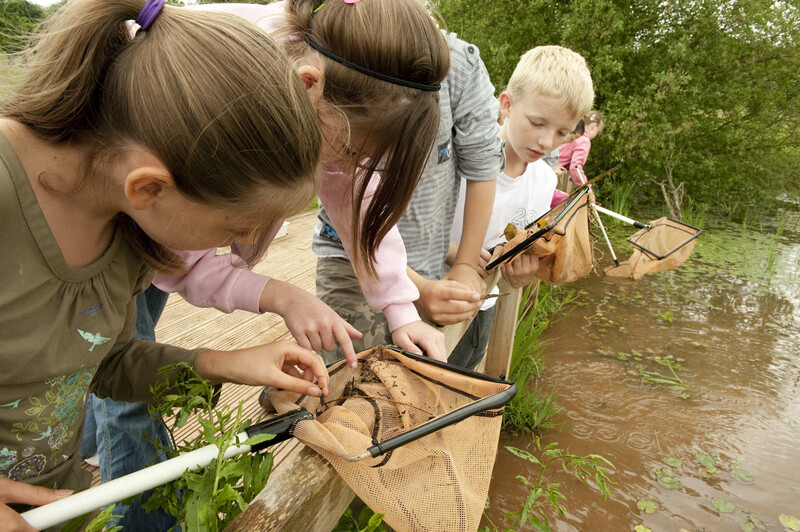 Over at Severn Valley Country Park they have a ‘What’s the weather like today?’ self-led trail. 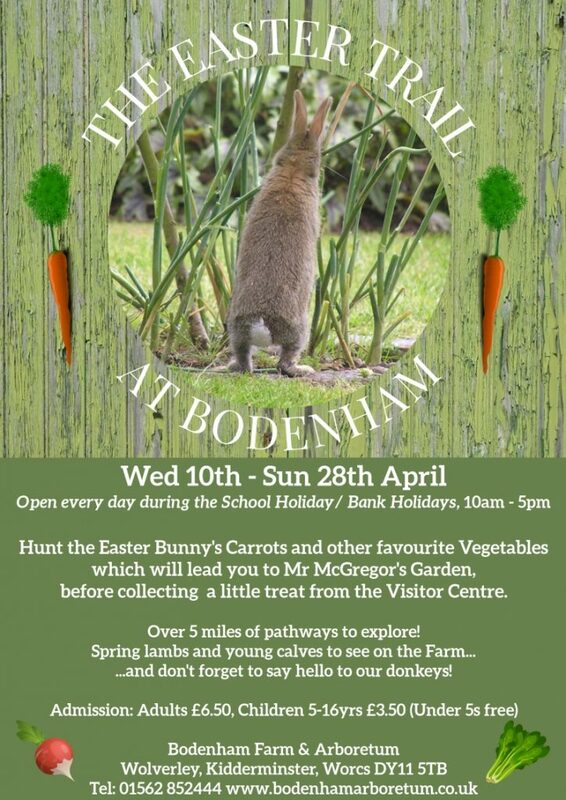 National Trust properties have Easter Egg trails, with Dudmaston having their at the main site on 21/22 and at Comer Woods 19-22 April. 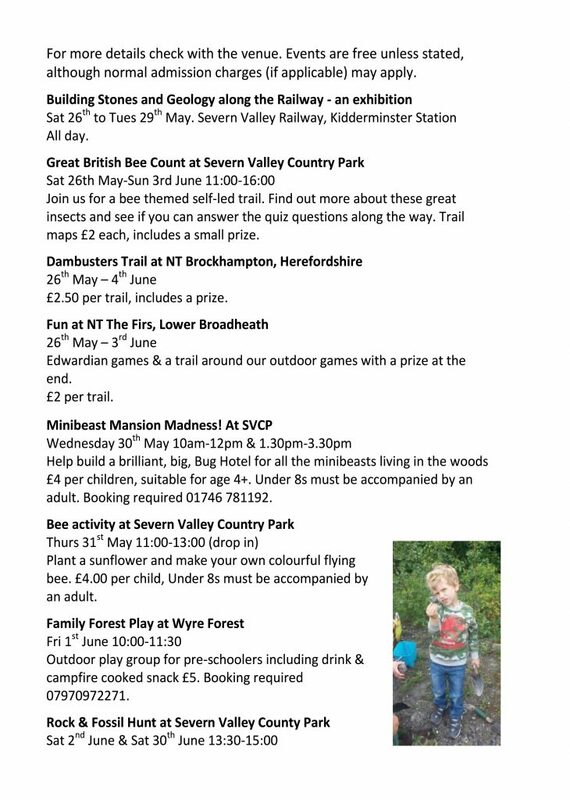 Severn Valley Country Park also have an egg hunt 19-22 April. 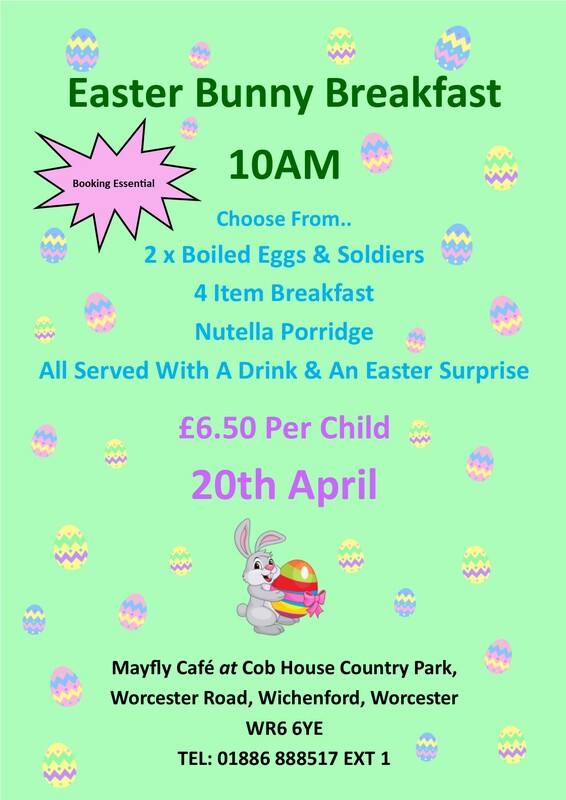 At Cob House Country Park they have an Easter breakfast where children can meet the Easter Bunny on Easter Sunday. 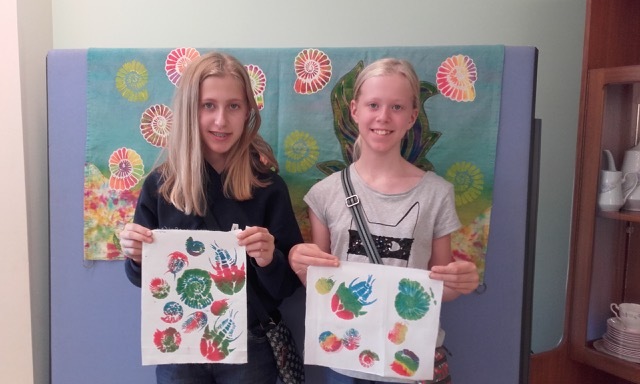 There are plenty of opportunities for arts and crafts. 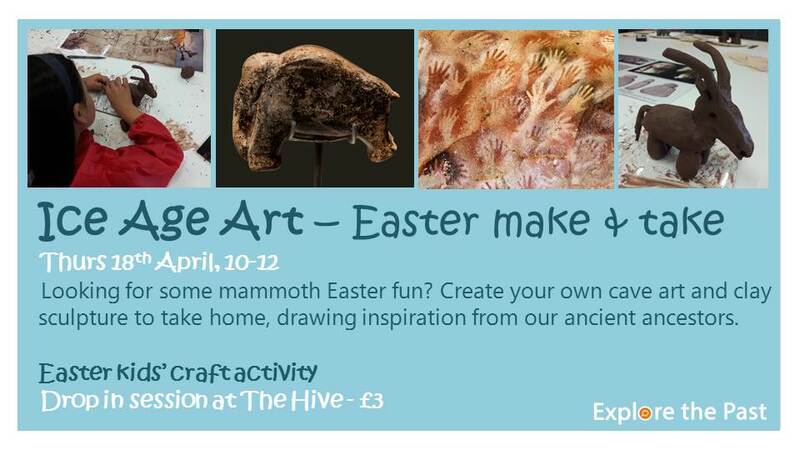 In The Hive you can have a go at Ice Age Art with Worcestershire Archive & Archaeology Service on Thu 18 April 10am-12pm, £3 per child. 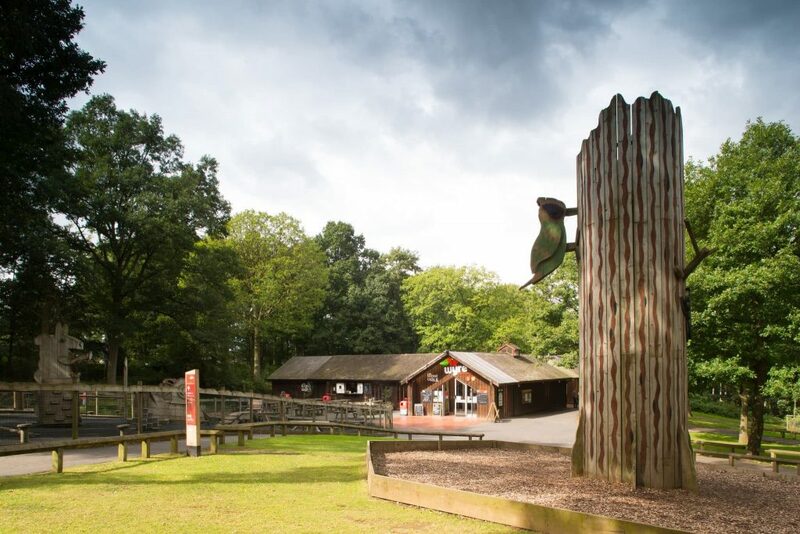 Cob House Country Park have various activities including Jumping Clay (15th), Build a Bear (17th) and Sand Art (17th) as well as pony rides. 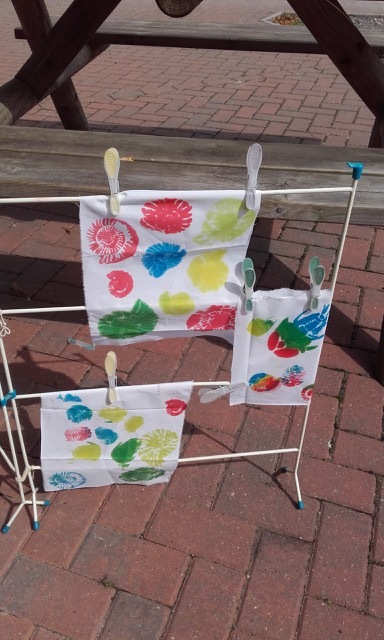 Bewdley Museum will have different craft activities each weekday during the Easter holidays. 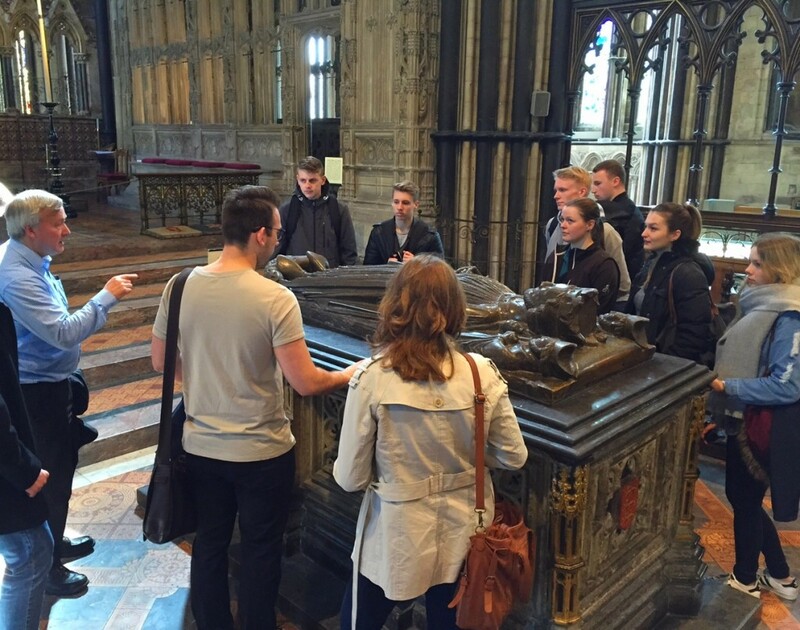 Worcester Cathedral have their range of Easter services over the coming week, as well as being open for visitors and look round this amazing building. Severn Valley Railway is up and running over Easter. 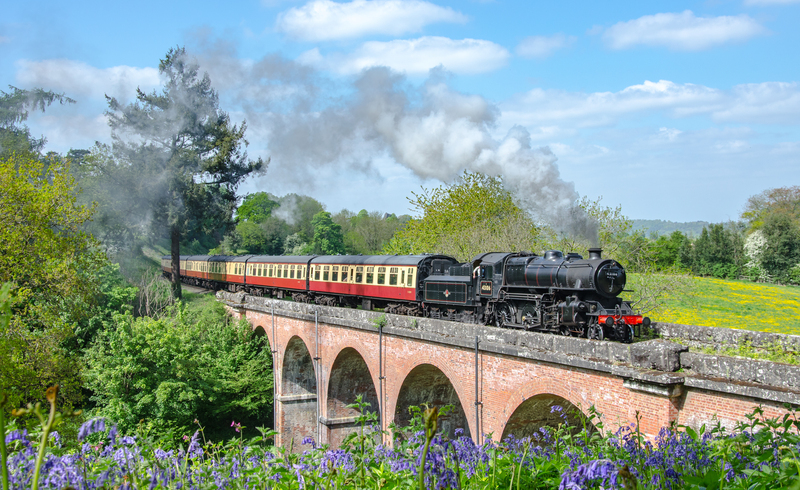 Services will run every day throughout the Easter Holidays from April 13th – 28th, stopping-off at each of their six, beautifully-restored, historic stations along the way. New to the venue this Easter is No. 7 ‘Typhoon’, a miniature locomotive (one third size), now proudly on display alongside the much larger, distinctive No. 600 Gordon and No. 7819 Hinton Manor. 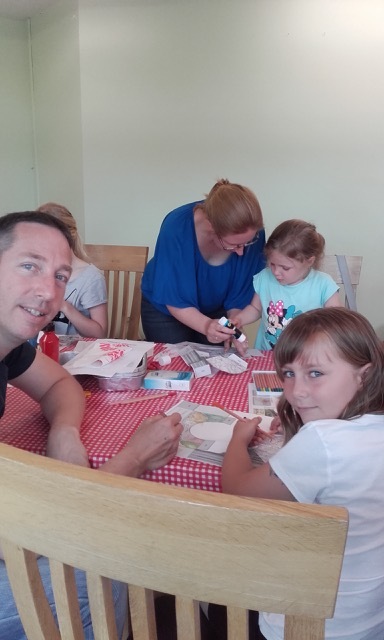 At the Engine House at Highley they have some free Superhero activities. 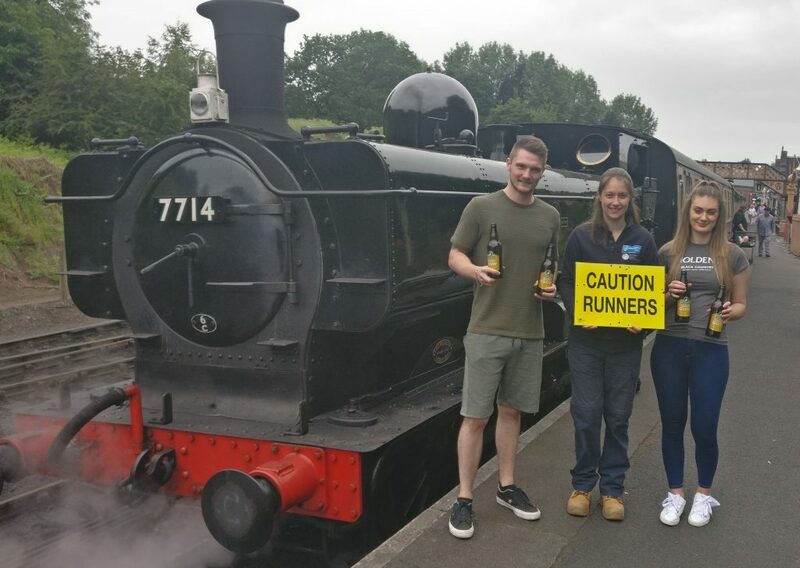 Stopping off at the Engine House at Highley, you’ll be able to take part in some amazing FREE activities, marvel at massive steam engines and maybe win yourself a totally ‘sweet’ prize too! The activities take place with ReachOut Arts from April 15th – 22nd only, from 11am – 3pm. 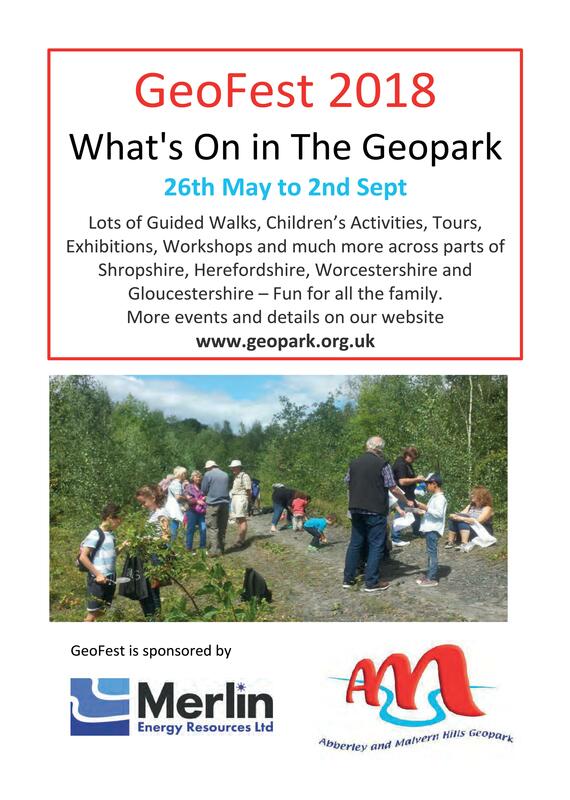 There’s plenty to do during the next couple of weeks in the Geopark! 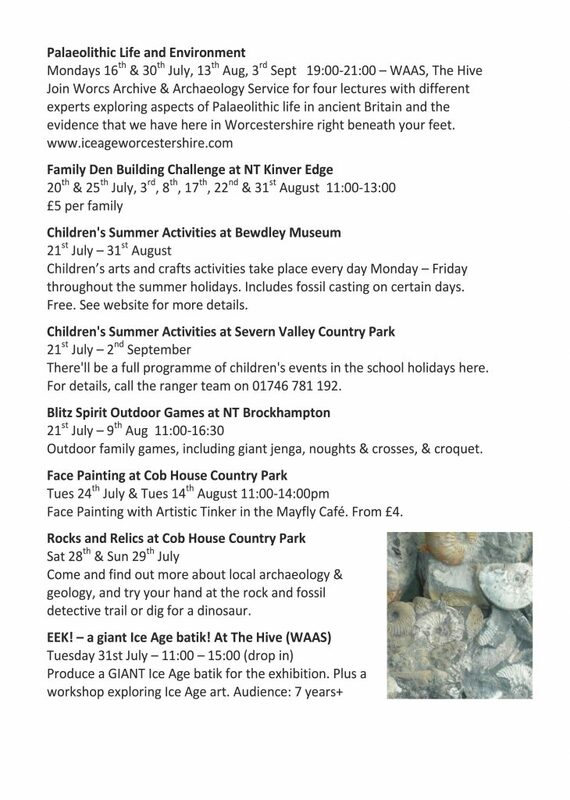 This weekend Bewdley Museum is blasting off the new season with a day of free entertainment for all the family. 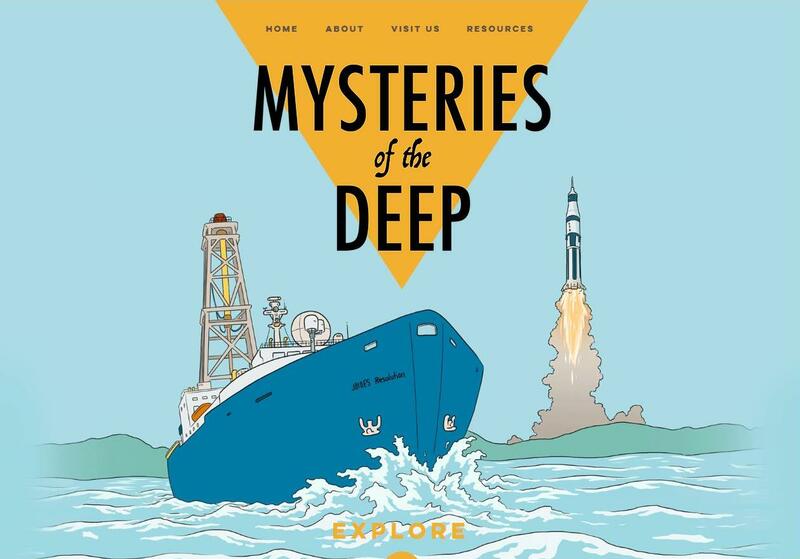 The reopening will showcase the new ’Orbiting the Earth’ exhibition’ which celebrates 50 years since the first Moon landings, with the chance to view rock samples from the Apollo missions from the late 1960s and early 1970s. An expert will be on hand to answer any questions. The reopening will also feature work from the ‘Ruskin in Wyre project’ which is supported by the Heritage Lottery Fund. 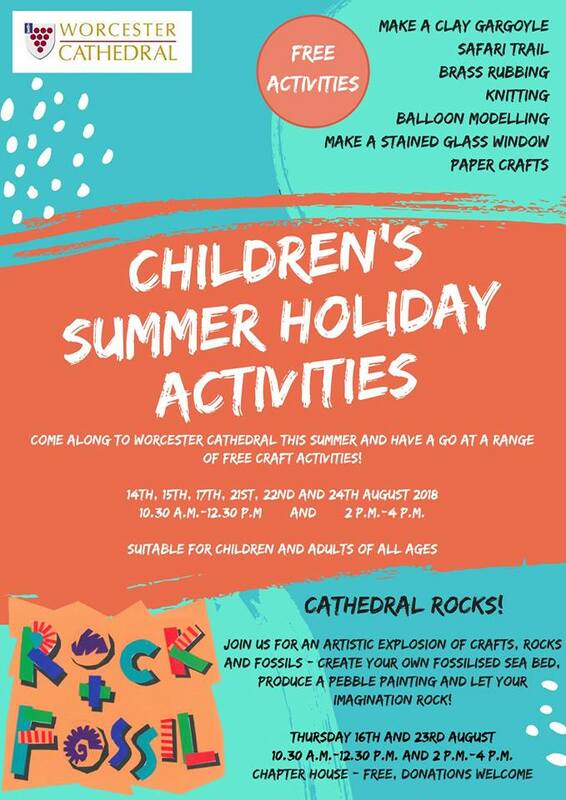 Naomi Hart’s Hotsy Totsy band will be performing live for visitors, crafts people will be demonstrating their skills and there will be special entertainment for the children. 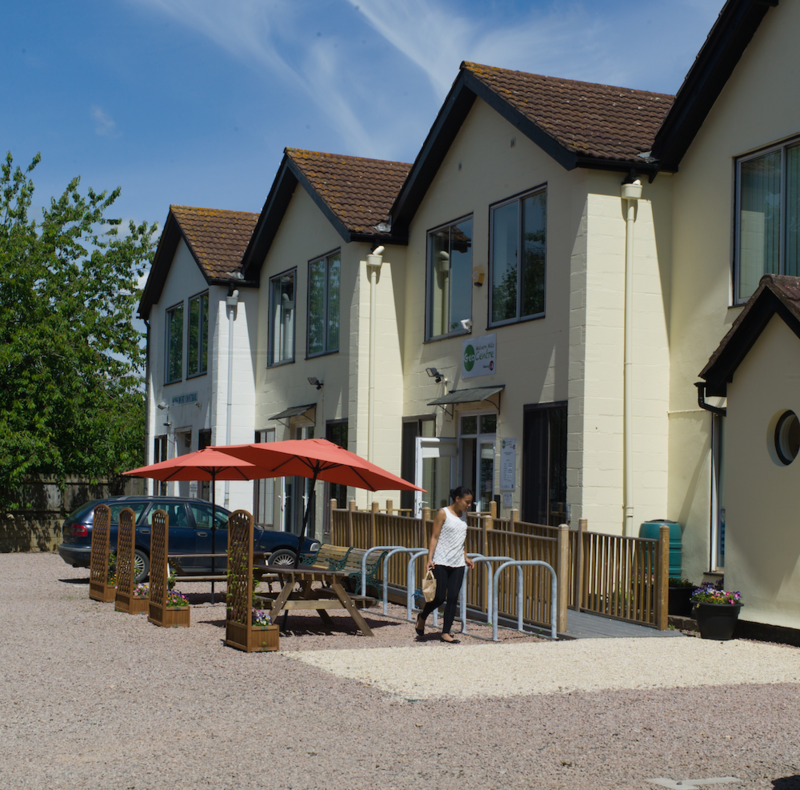 The museum’s Garden Kitchen café will also offer Fairtrade, local and sustainable food. 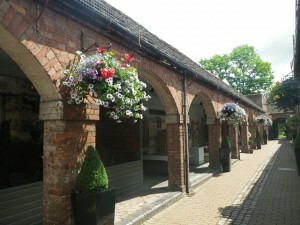 Visitors have the opportunity to buy unique handcrafted gifts and merchandise from the museum shop. 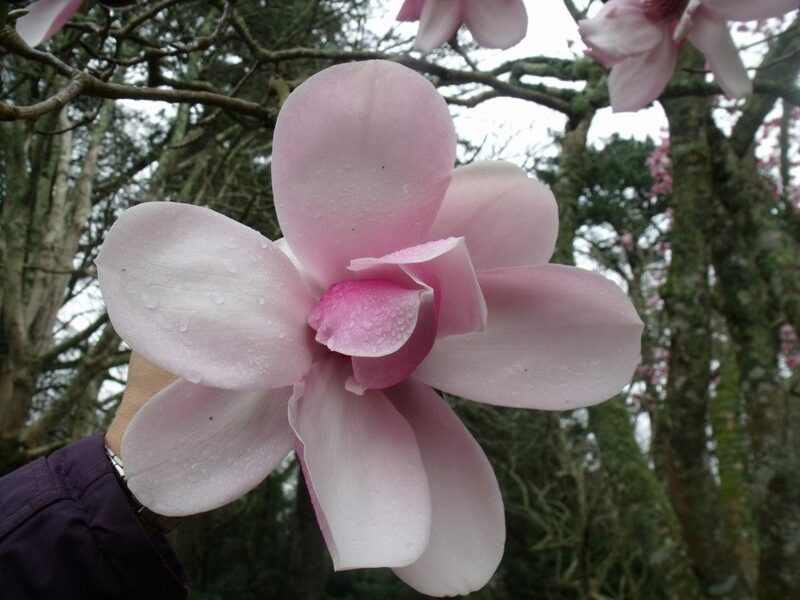 All this action is taking place on Saturday 2 March, from 10am until 4.30pm – so don’t miss out! 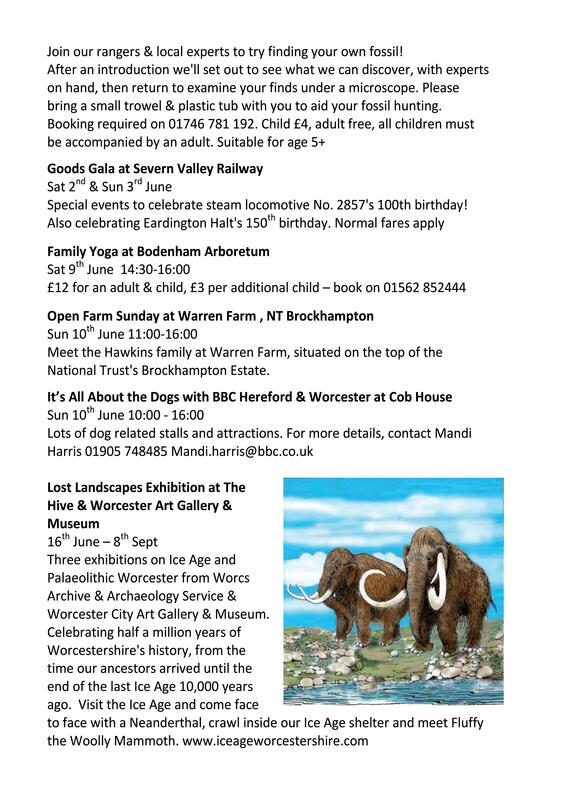 Looking for something a little different to do in the Half Term holidays? 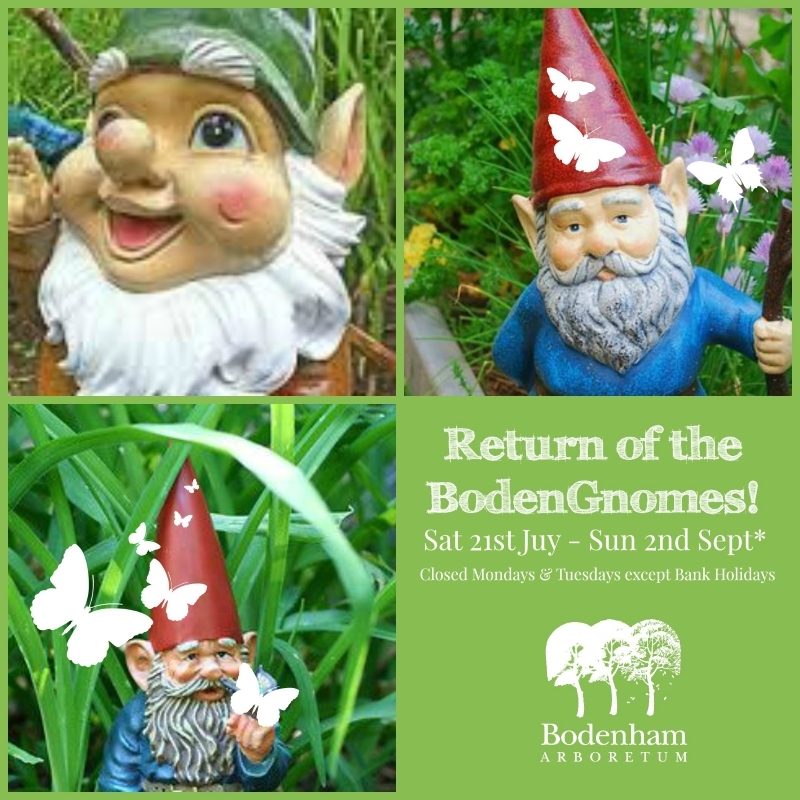 Then come along to Bodenham’s Gingerbread Trail! 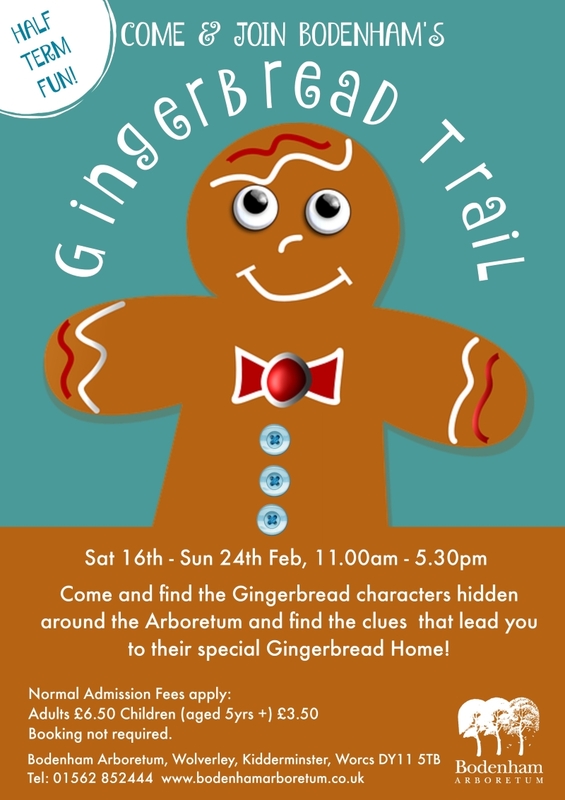 Search for the hidden Gingerbread characters around the Arboretum. Each time you find a Gingerbread Man you will also be given a clue that will eventually lead you to their special Gingerbread Home! Normal Admission Fees apply: Booking not required, simply turn up. There are a number of special events for children. Check out the website for prices. 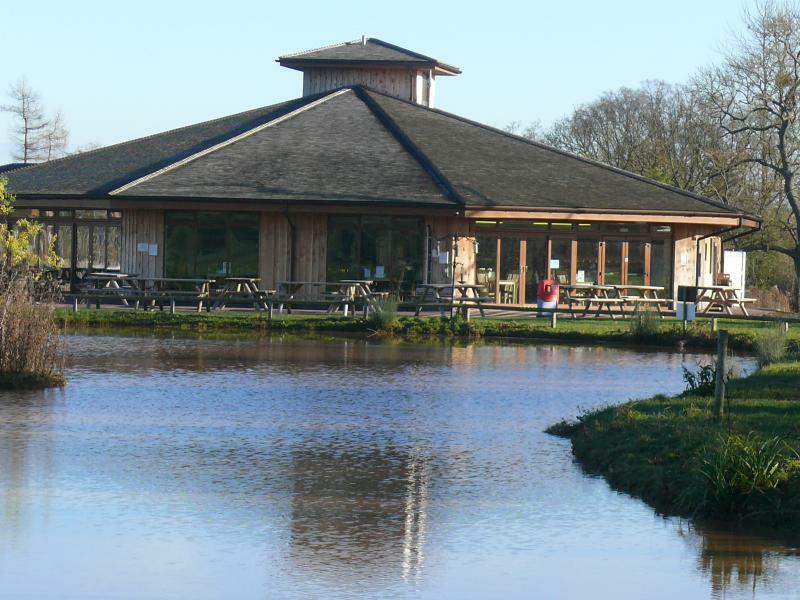 Please be aware the visitor centre and cafe will be closed for building work during half term. 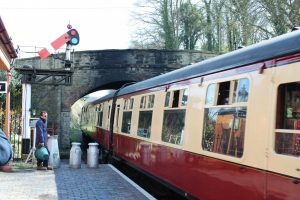 A refreshment kiosk will be open serving drinks and snacks to takeaway but light lunches (jacket potatoes, sandwiches, soup) will not be available. 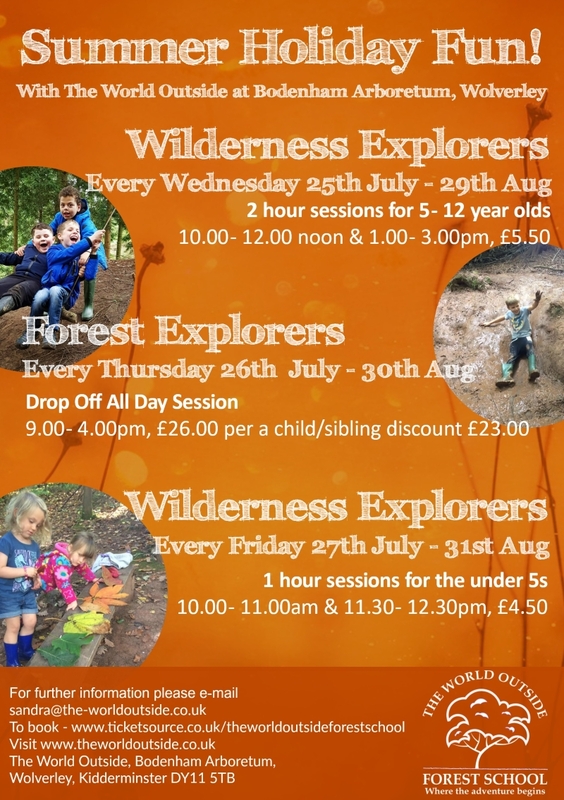 The ranger will take you down into the woods to search for spiders, earwigs, worms, slugs and other bugs who live in the log piles and leaves found on the woodland floor. 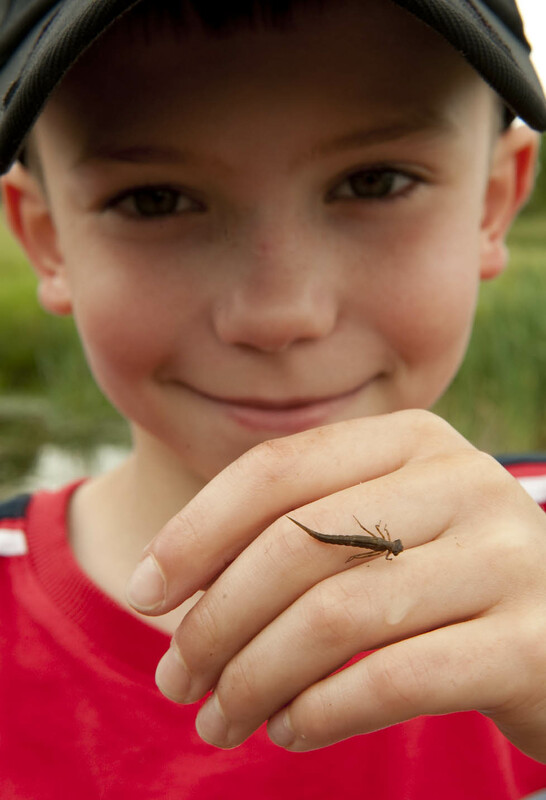 The mini beast hunts are FREE to join, but please call 01746 781 192 to book your place. The rangers will be setting off at 11.30am and 1.30pm. Meeting point is outside the visitor centre. We all know about the wonderful world of Dinosaurs, and the giants that lived on land. But what about the monsters that swam in the depths of the oceans? 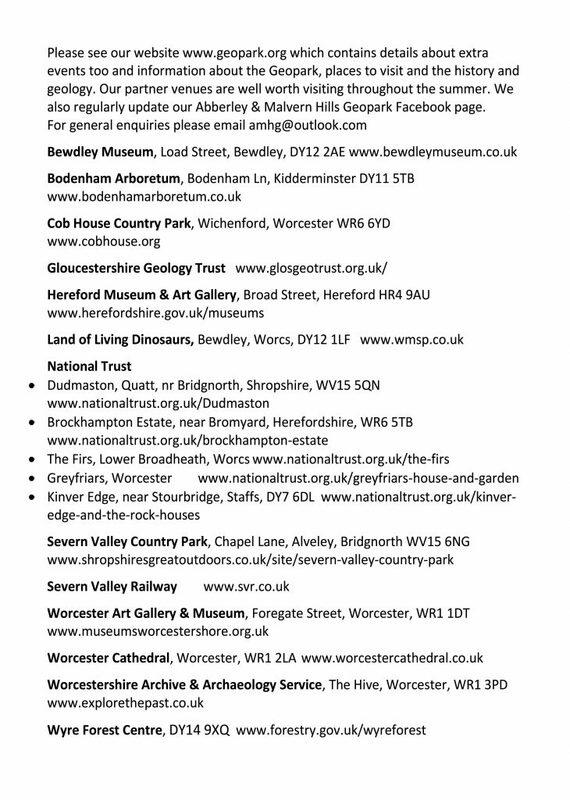 Greyfriars has heaps of love for the city of Worcester and they’re taking part in the Love Worcester Heritage Festival. 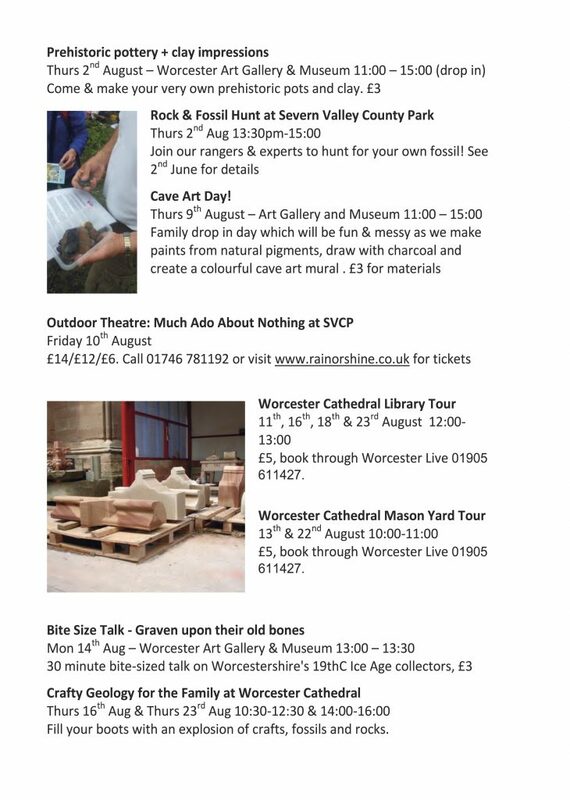 You can re-trace the footsteps of Greyfriars’ past residents and discover what Greyfriars means to Worcester’s heritage. The Worcester Re-enactors are set to bring history to life inside the house. You’ll see Tudors, the Home Guard, and more! Drop into The Hive’s children’s library for this family event. 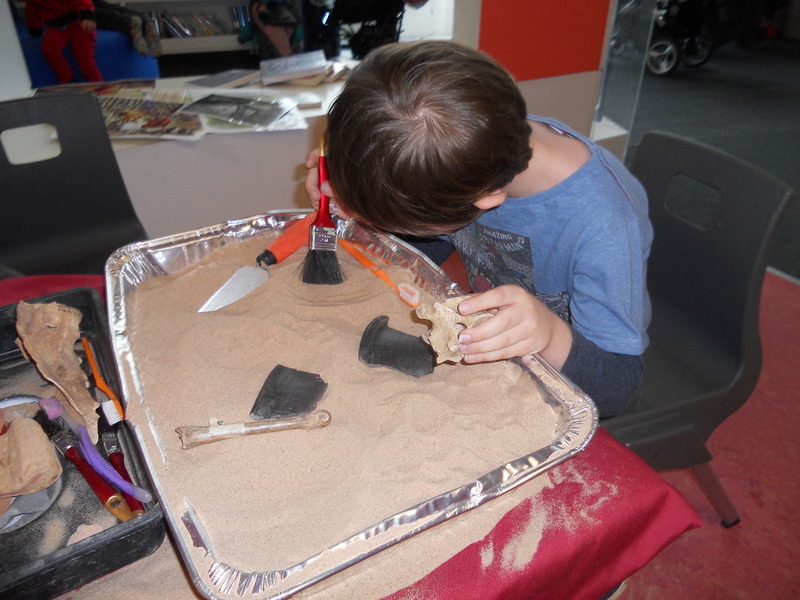 Have a go at digging in the sand pit and see what real archaeological objects you can find. Have a go at writing with a quill and play a game soldiers in the Civil War would have played. Part of Love Worcester festival. 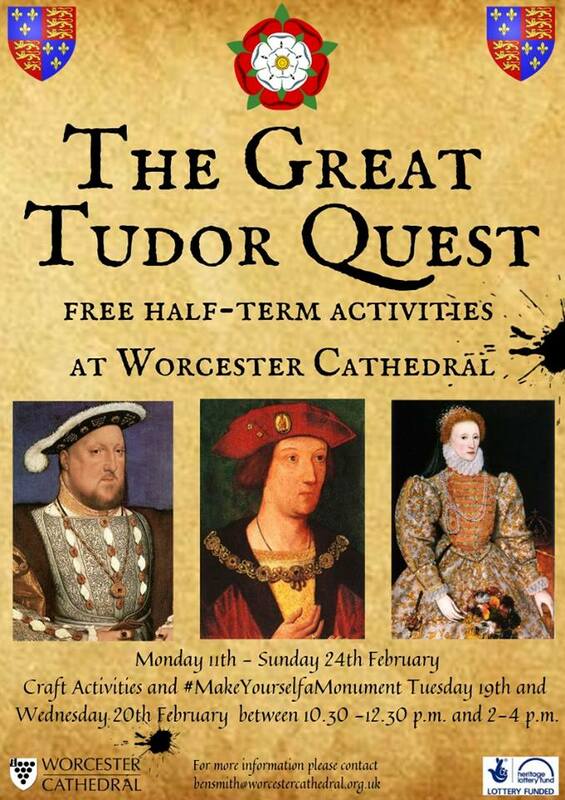 Come along to Worcester Cathedral during half term. 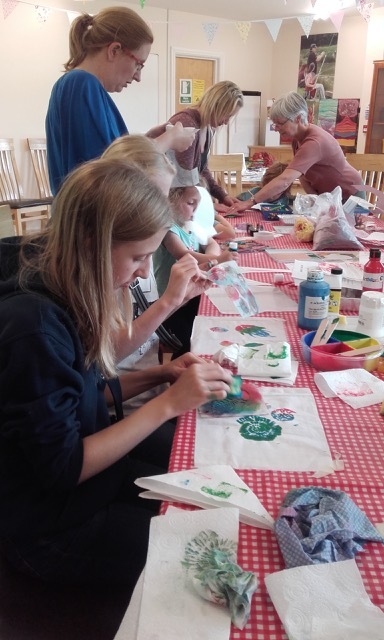 As well as the Great Tudor trail and the Prince Arthur Exhibition there are Tudor-themed craft activities on 19 & 20 February 10.30 – 12.30 & 2-4pm. Sherlock Holmes set to visit Severn Valley Country Park later in November with a thrilling new comedy. 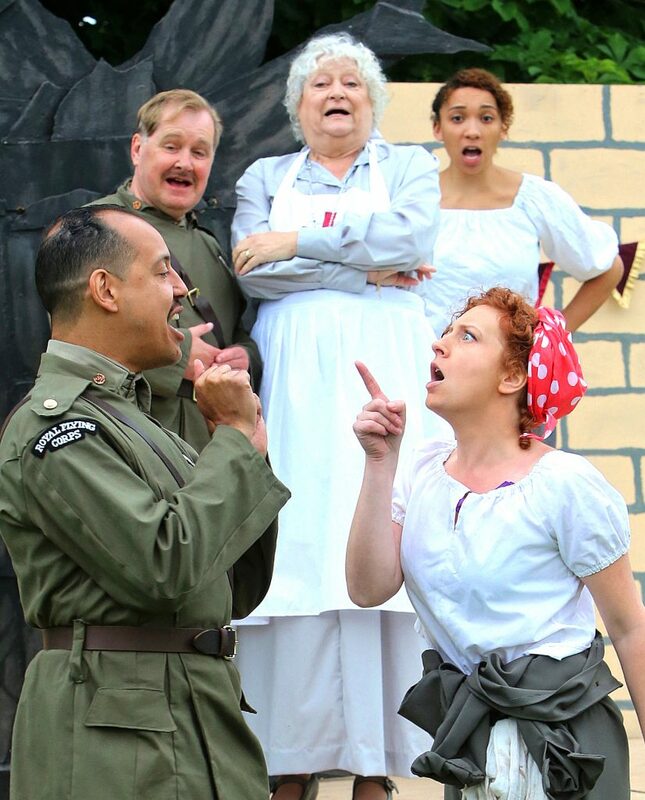 Famed for their Shakespeare summer season UK tours, professional Gloucester based Rain or Shine Theatre Company are delighted to be on tour again this winter with Sir Arthur Conan Doyle’s classic characters which is booked into theatres, village halls and other community venues across the UK. 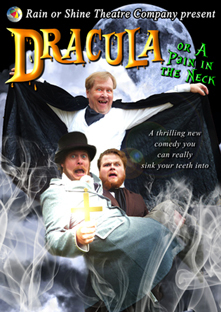 After the success of The Hound of the Baskervilles, and Dracula; Rain or Shine are dying to bring you yet another fantastic evening of entertainment with their own individual comedic style! The dynamic duo return to solve one of the Victorian era’s biggest mysteries. Sherlock Holmes and The Curious Case of Dr Jekyll & Miss Hyde. This Winter join Sherlock Holmes, together with his trusty sidekick Watson, and watch a case unfold that is less elementary, and more fantastical than ever before. 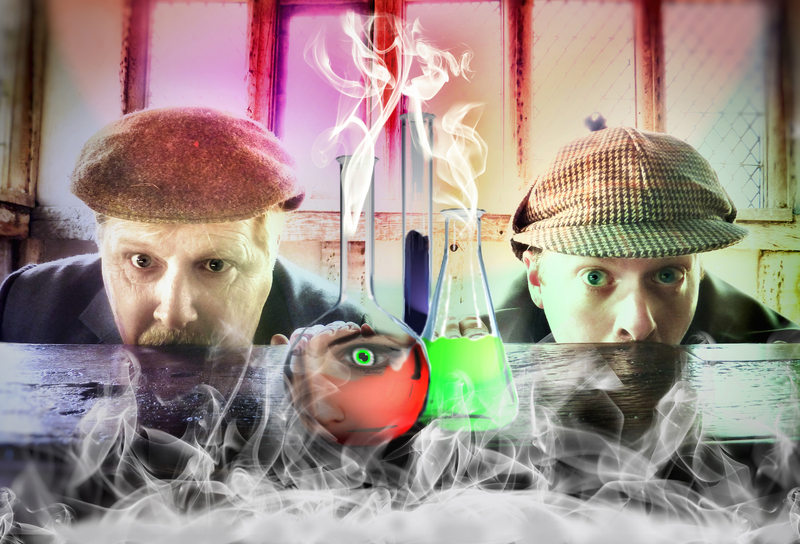 Hailed as ‘a delicious mirthfest’ Rain or Shine will once again be reinventing the classic Sherlock Holmes characters using their now signature ‘Morecambe & Wise-ish comedy’ style for another season of mystery, mayhem, but above all multi-role madness! 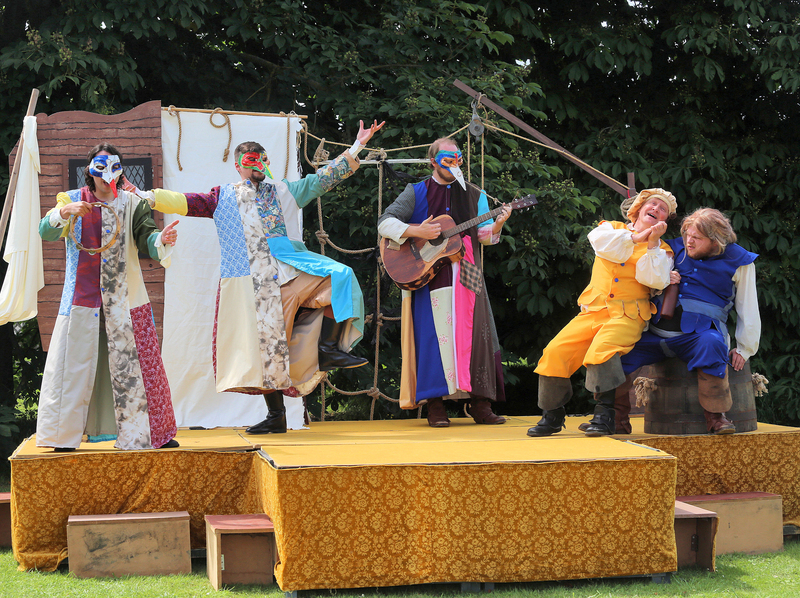 Set in authentic Victorian costume, with a cast of four playing a whole host of characters, Rain or Shine are sure to delight and enchant those new to the tale, and those who already know it. The tour includes a ‘one night only’ performance in Severn Valley Country Park, Visitor Centre, Alveley, Bridgnorth, Shropshire, WV15 6NG on Thursday 29th November at 7.00pm. This is an indoor performance and will be held in the visitor centre. Tickets priced £10.00 (child £6.00) are available from the venue Tel 01746 781192, or direct from the Rain Or Shine credit card hotline: 03306 600541, e-mail tickets@rainorshine.co.uk or online via www.rainorshine.co.uk. 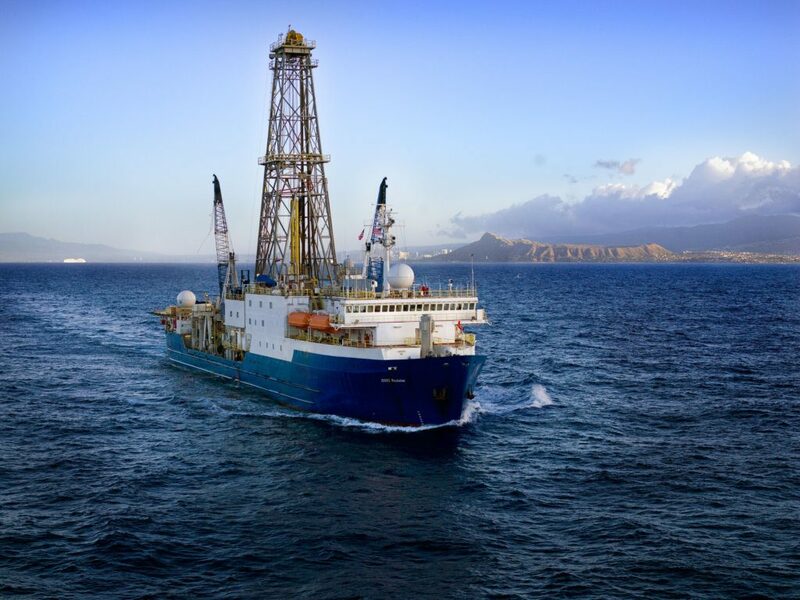 The extension of the Geopark to include the Woolhope dome was launched by Jesse Norman MP at a special event in Hereford last Friday. 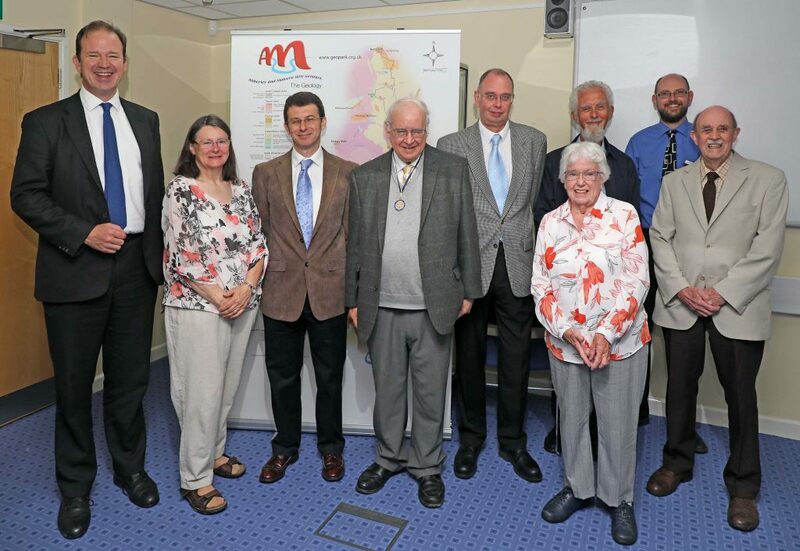 The Woolhope Club, who have played a big role in the inclusion of the Woolhope Dome, Hereford City and parts of the Wye valley, hosted the event at the Hereford Museum Resource Centre. Gerry Calderbank, Vice Chair of the Geology Section, welcomed the guests before Jesse Norman, local MP, officially opened the extension. 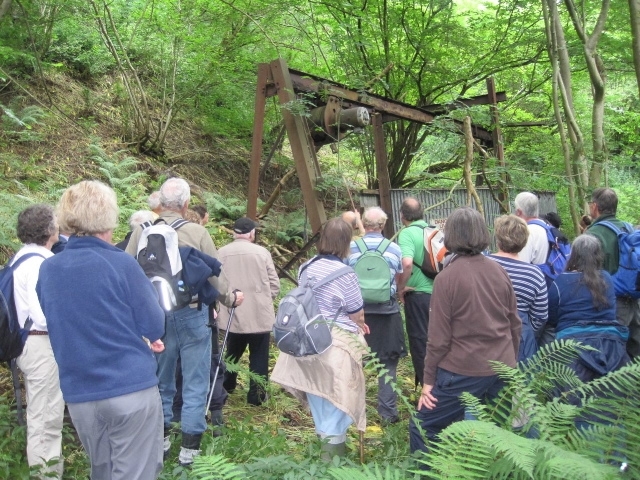 John Payne then gave a talk about the rich geology of this part of Herefordshire and why it is so significant. 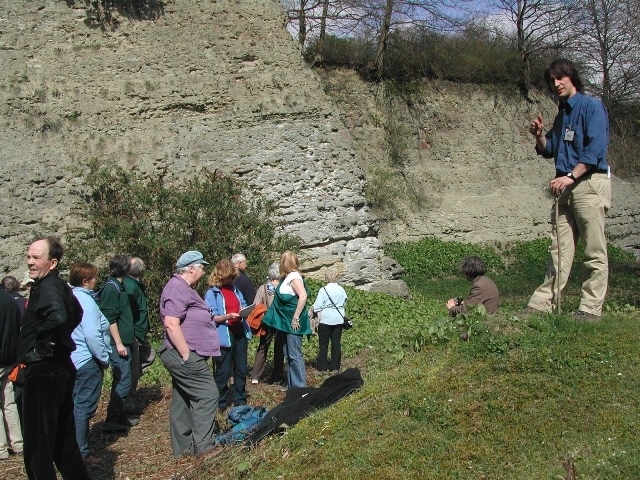 As well as having significant landscape features it was also important in the early study by Victorians and the original members of the Woolhope Club, hosting many outings and field trips. It was therefore very appropriate for them to host the launch. It is a great addition to the Geopark in terms of the special landscape, including more of Herefordshire, and having Hereford as a gateway city to the Geopark. The event also launched GeoFest, the annual programme of events by Geopark forum members. Representatives from Merlin Energy, GeoFest sponsors, were on hand to do the honours and declare it open. 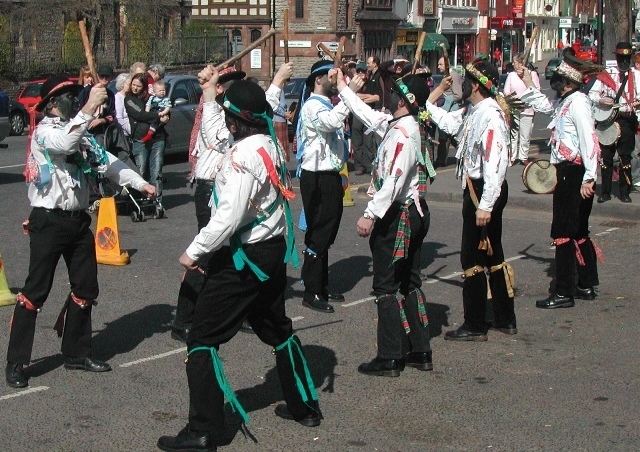 You can find out more about the many varied events here. BACK BY POPULAR DEMAND! 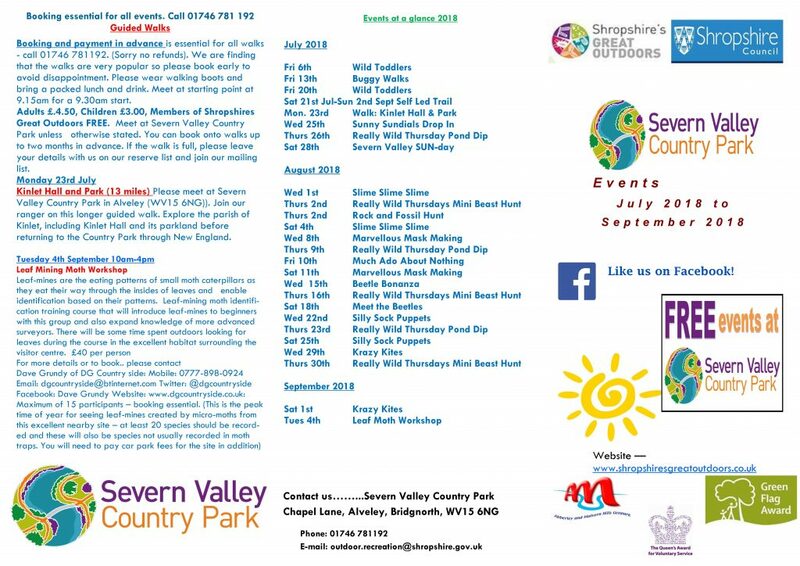 Shropshire Council Outdoor Partnerships Team are delighted to welcome back renowned photographer of the night sky, Peter Williamson, to Severn Valley Country Park for a magical evening of star gazing in the clear skies of the Severn Valley. Peter is the BBC Radio Shropshire Astronomy Correspondent. The evening will begin with Peter giving a slide show of his amazing images of the night sky. 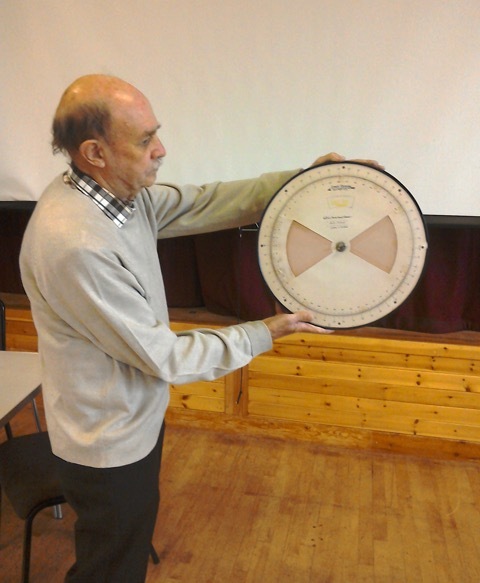 He will also show people the different constellations that are visible during the winter months. 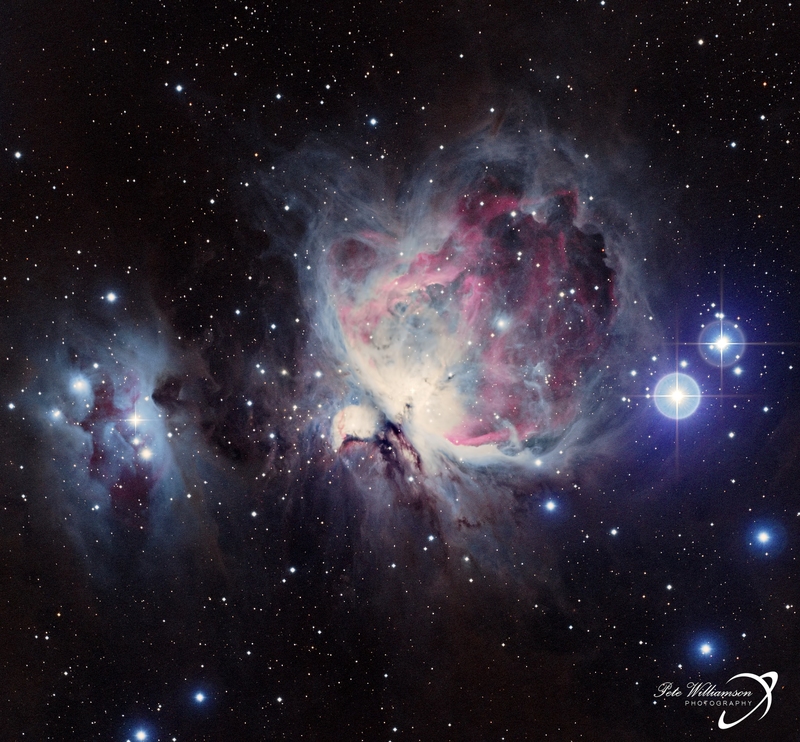 Other members of Shropshire Astronomy Group will also be present with a number of telescopes. Weather permitting, there will be opportunity to take a look at the stars and planets overhead with expert supervision. The Visitor Centre at Severn Valley Country Park benefits from panoramic views over the Severn Valley and dark skies. 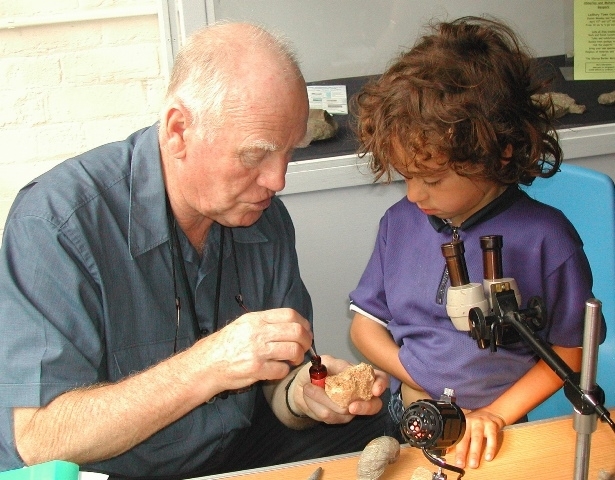 The event is suitable for all ages (including children over 8). Adults £8, Children under 16 £6, Family ticket (2 adults, 2 children) £25. Included in the ticket price is soup and a roll. 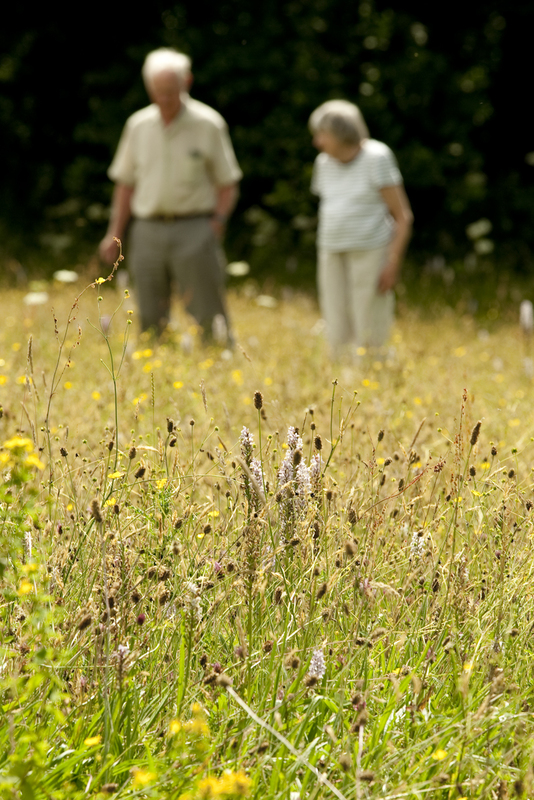 Members of the Shropshire Great Outdoors Membership scheme get a 10% discount. Mindfulness and Meditation: What’s it all about? 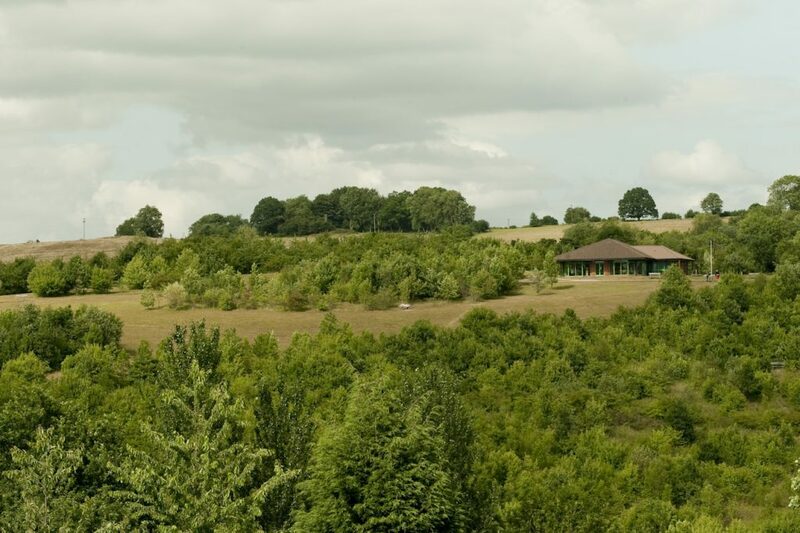 Severn Valley Country Park is working with fully qualified ‘British School of Meditation’ teacher, Mandy Clarke to unravel the mysteries of mindfulness and mediation to their visitors. Research has shown that people’s day-to-day busy lifestyles could benefit from taking time to de-stress through mindfulness and meditation. It is said it is essential for personal wellbeing to take a few minutes each day to achieve a positive mind-body balance which will help people cope better with causes of stress and anxiety. During the course, to be held on Saturday 17th February, Mrs Clarke will help visitors discover the benefits of mindfulness and as well as help them to learn a variety of meditation techniques. There will be discussions around what meditation is and help dispel myths that surround both disciplines. In addition there will be an overview of several different types of meditation as well as guided meditations and mindfulness tips. 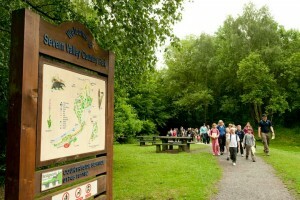 The course will be held in the visitor centre at Severn Valley Country Park on Saturday 17th February 9.45am-11.15am. It is £7.50 (including refreshments). Booking is essential as there are limited places on the course. Payment required at time of booking. Please call 01746 781 192. If the course proves popular, they will continue with Mindfulness and Meditation Beginners Part 2, Intermediate Part 1 and Intermediate Part 2. Dates and times to be confirmed. If you have ever wanted to know more about the valuable work Cuan Wildlife Rescue do, then join Shropshire Council rangers at Severn Valley Country Park on Thursday 8th February. Members of the Cuan Wildlife Rescue team will be on site to give an illustrated talk about the varied work they do. 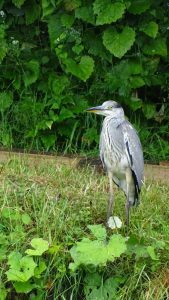 Cuan Wildlife Rescue take in sick, injured or orphaned wild animals and birds, with the aim of nursing them back to health and releasing them back into the wild. In fact, great emphasis is placed on returning the animals to the area they were found to ensure they are back in familiar hunting ground and on their own territory. 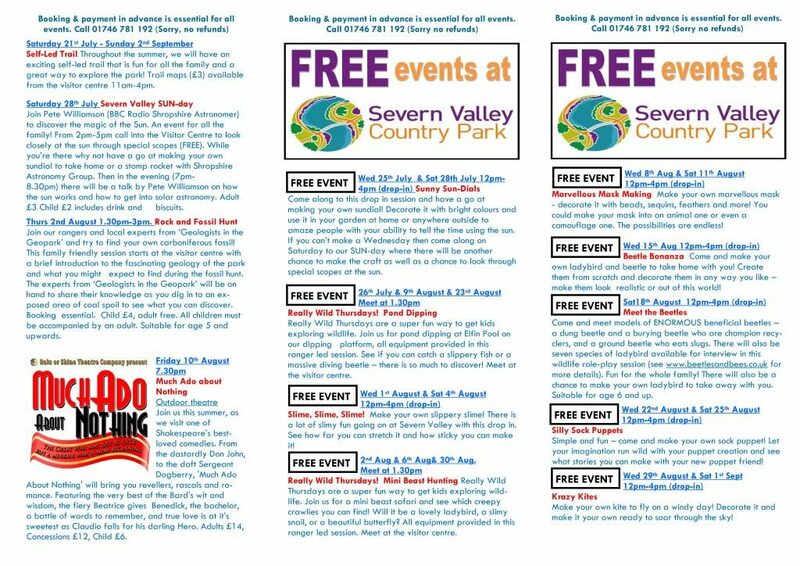 The talk will be held in the visitor centre at Severn Valley Country Park on Thursday 8th February 2018, 7.30pm-9pm. Adults £3.00, Child £2.00. Price includes hot drink and biscuits. Please call 01746 781 192 to book your place to find out more about this great organisation. The World Owl Trust (WOT) runs conservation programmes both nationally and internationally which help protect populations of endangered owls. 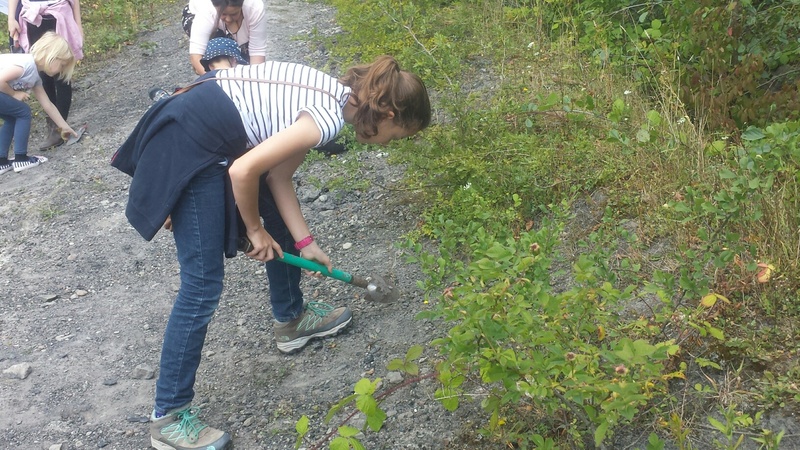 WOT look at the environmental problems which impact the habitats favoured by owls as well as impacts to food sources. WOT are working hard to restore such habitats and have had success with increasing numbers of European Eagle Owl as well as the Barn Owl. 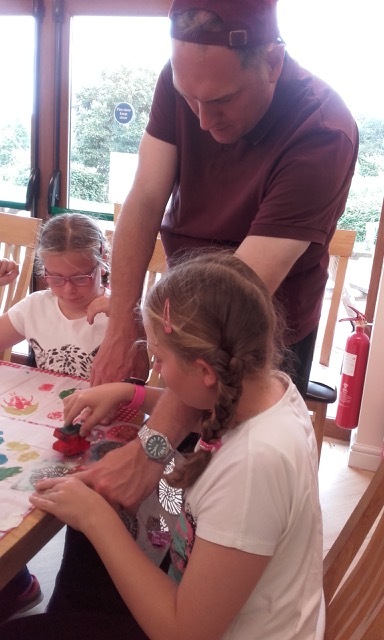 The Trust is a registered charity and it relies on donations received as well as the work of volunteers. 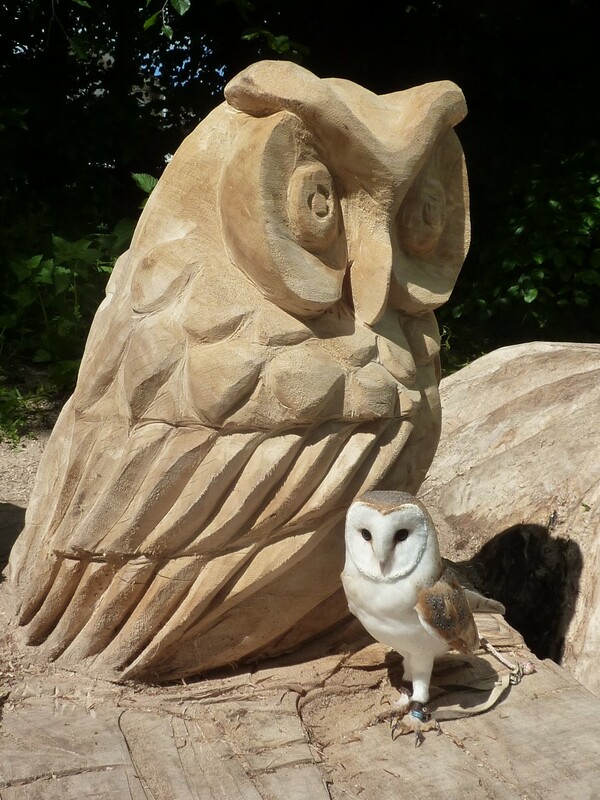 Accompanying Mr Peace will be Barny the Barn Owl and, hopefully, Indie the Long Eared Owl. The talk will be held in the visitor centre on Thursday 7th December 2017. 7.30pm-9pm. Tickets are £3.00 adults, £2.00 children. Price includes hot drink and biscuits. Please call 01746 781 192 to book your place. 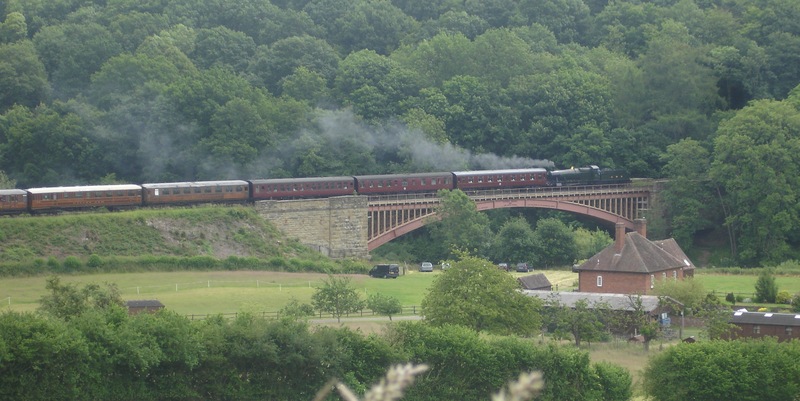 DRACULA is set to visit Severn Valley Country Park on 1st December. Rain or Shine Theatre Company proudly present a new adaptation of Bram Stoker’s famous Gothic fantasy… With a twist! After their success last winter as ‘a delicious mirthfest’ with the much celebrated comic version of ‘Hound of the Baskervilles’, Rain or Shine are dying to bring you yet another Classic novel in their own individual comedic style by raising the stakes by expanding on their new brand of ‘Morecambe & Wise-ish comedy’ with another season of mystery, mayhem, but above all multi-role madness! Dracula 1897 : Transylvania… A lone English solicitor makes an ill-fated visit to an important client at a remote and mysterious castle. Soon afterwards, Count Dracula moves to London, where a bizarre plague begins to stalk its inhabitants. Can our intrepid team led by maverick-doctor Professor Abraham Van Helsing prevent the infamous Count from getting his fangs into everyone before his grip over the people of London proves fatal? 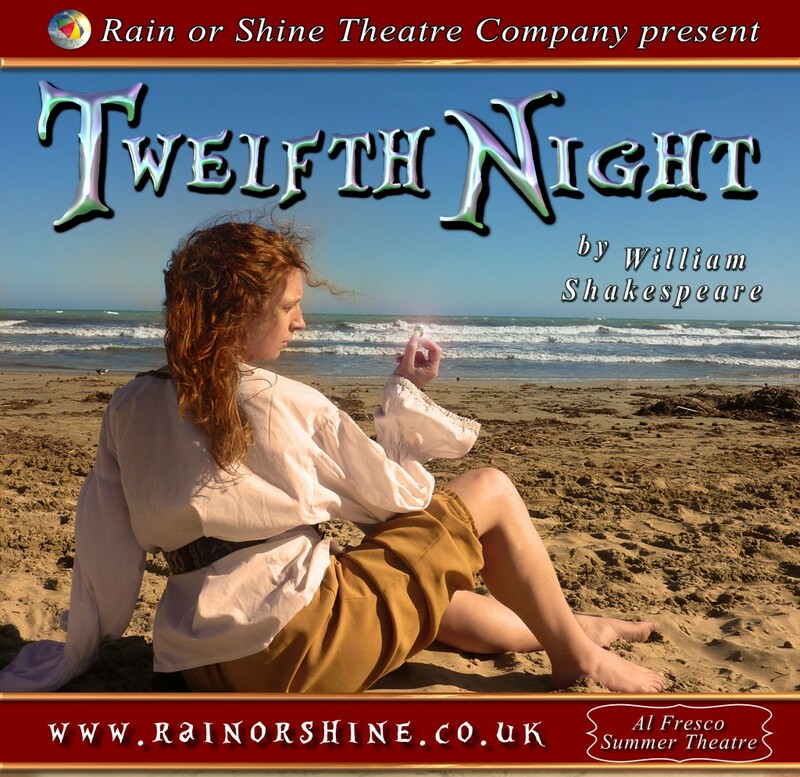 An atmospheric tale of maidens in distress, dark nights and vampires is here presented by Rain or Shine as you’ve never seen it before…promising a fang-tastic evening with lots of bite. The tour includes a ‘one night only’ performance in the Severn Valley Country Park, Alveley on Friday 1st December at 7.00pm. Tickets priced £10, child £6, are available from 01746 781192 or direct from the Rain Or Shine credit card hotline: 0330 660 0541, e-mail tickets@rainorshine.co.uk or online via www.rainorshine.co.uk. Cob House Country Park has another range of exciting activities and events over the half term period and is a great place for a day out. 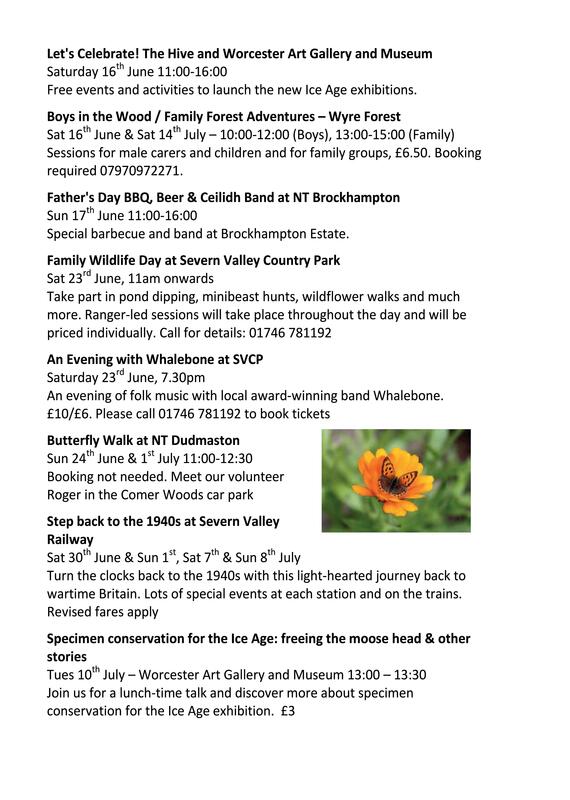 A summary of their events is below and check out their website for full details, prices and how to book . 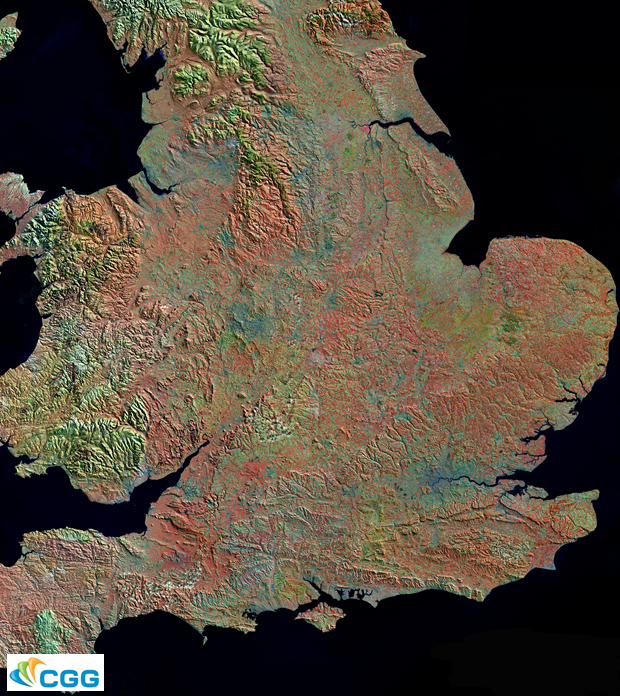 Space satellites now provide exquisite photographic detail of the Earth’s surface. This exhibition shows the local landscape of hills, rivers and rocks as never seen before. Above is a satellite image of the southern part of Britain using a technique known as ‘false colour’ to enhance the exposed rocks and highlight landscape features. 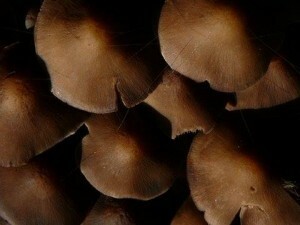 Similar but more local photographs will feature in the exhibition. Satellite images and explanations are being provided by the Geological Remote Sensing Group and associated field scale photos and interpretations are being supplied by Geologists in the Geopark. A day school with some local field work to celebrate the Bicentenary of William Smith’s first geological map of England & Wales. 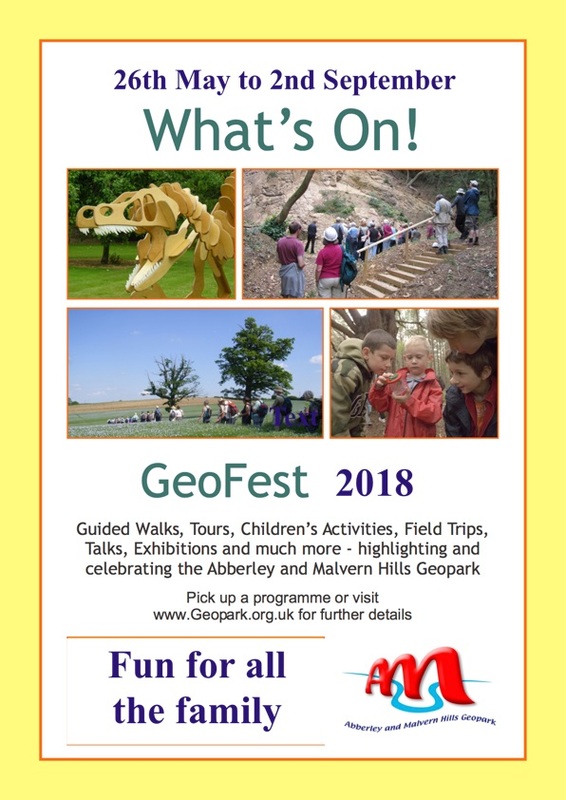 Hosted by Geopark president and geologist extraordinaire Chris Darmon at the Malvern Hills GeoCentre. Price: £25.00 adult, £20.00 under-19 student, including light lunch and refreshments. 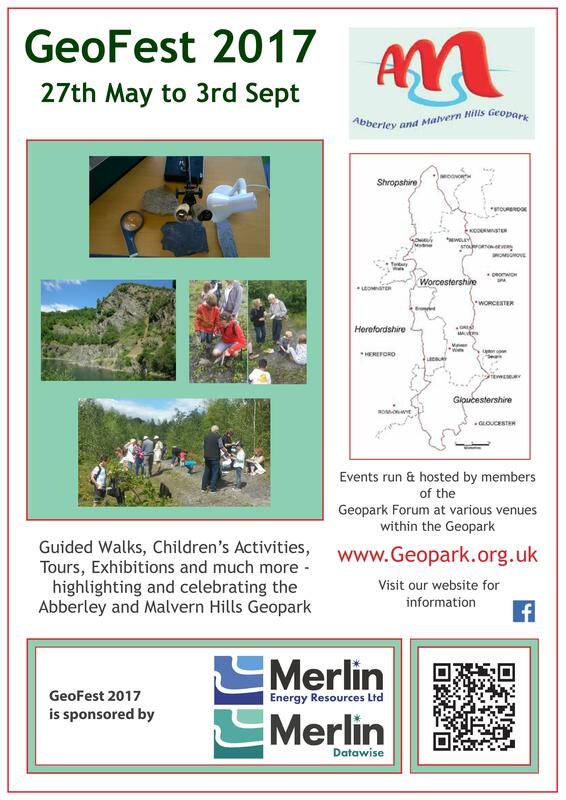 As President of the Abberley & Malvern Hills Geopark, I invite you to come and join me as we explore the varied geology of this part of the Heart of England! 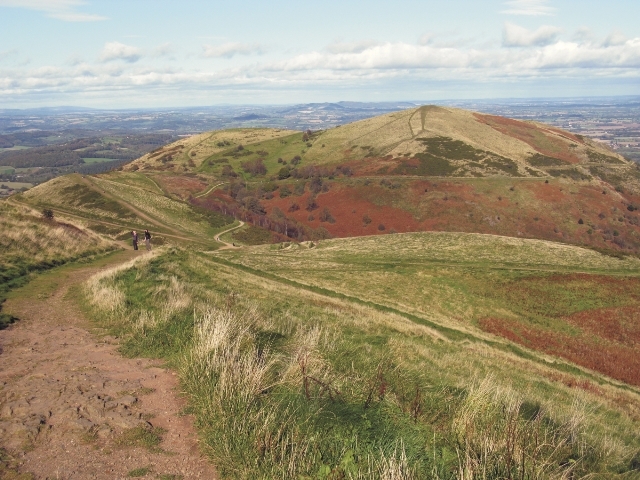 There are breathtaking views, fine scenery and excellent rocks within the Geopark that extends across 1250 square kilometres and takes in parts of the four counties of Gloucestershire, Herefordshire, Shropshire and Worcestershire. 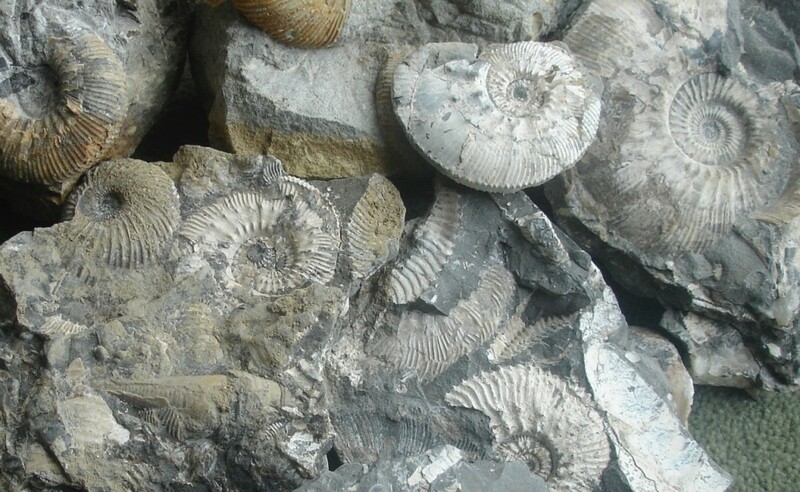 In the Abberley and Malvern Hills Geopark we’ll find outstanding geology that spans 700 million years of Earth’ history. 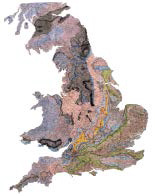 The story begins with Precambrian igneous and metamorphic rocks and then moves on through sediments of all ages, ending with the Triassic desert sandstones of Bridgnorth. 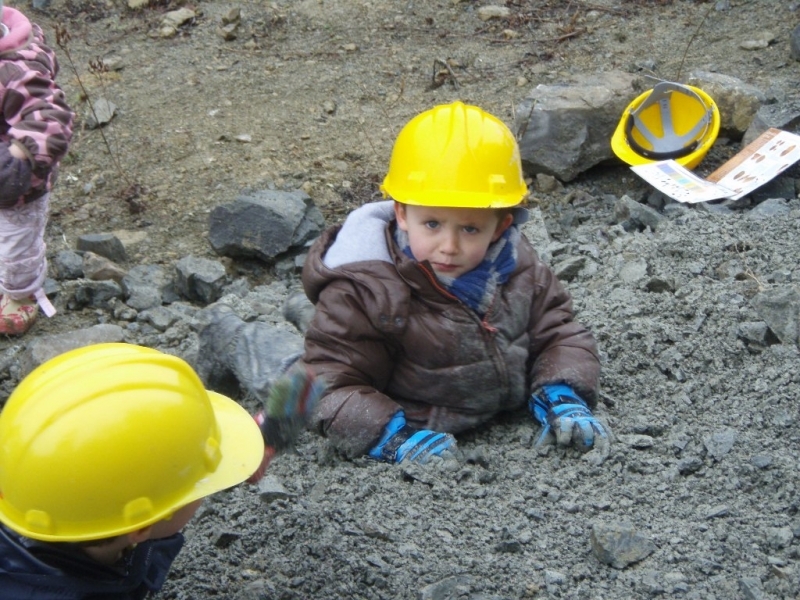 We’ll see geology from a steam rain and even animatronic dinosaurs in the Wildlife Safari Park! 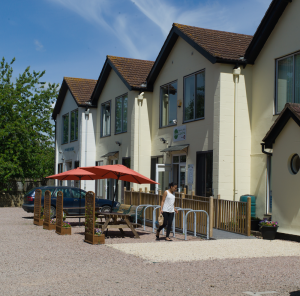 We’ll stay at the centrally located Great Malvern Hotel where we will get well looked after and be able to sample good local food. 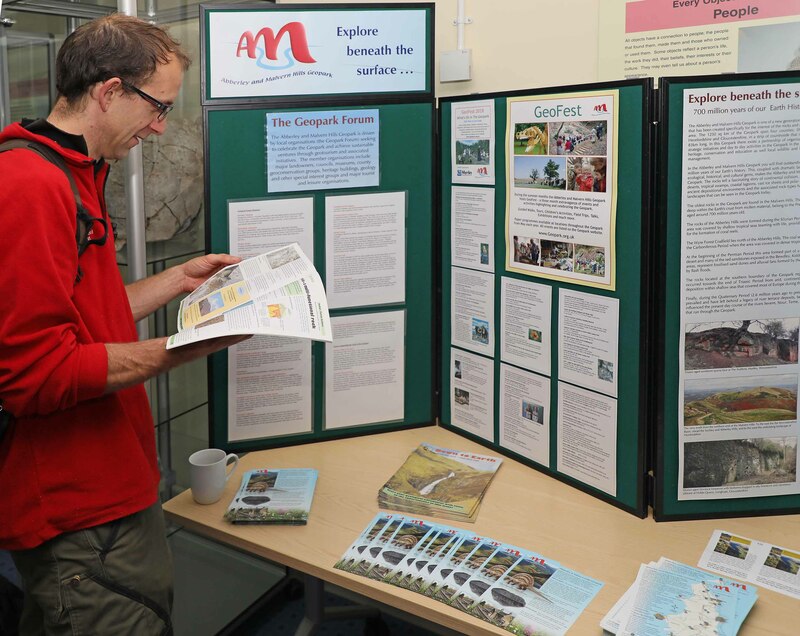 This is a great opportunity to explore some of the finest geology in England over the May Day Bank Holiday weekend. 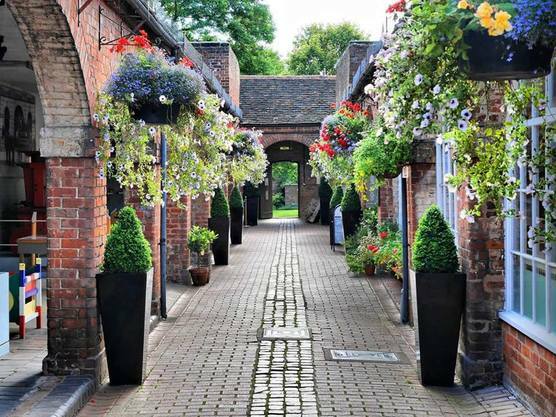 The cost of the 5-night trip is £695.00 per person in a double/twin room and £850.00 for single occupancy. We expect this trip to book up quickly – so you are advised to contact us soon for a booking form! 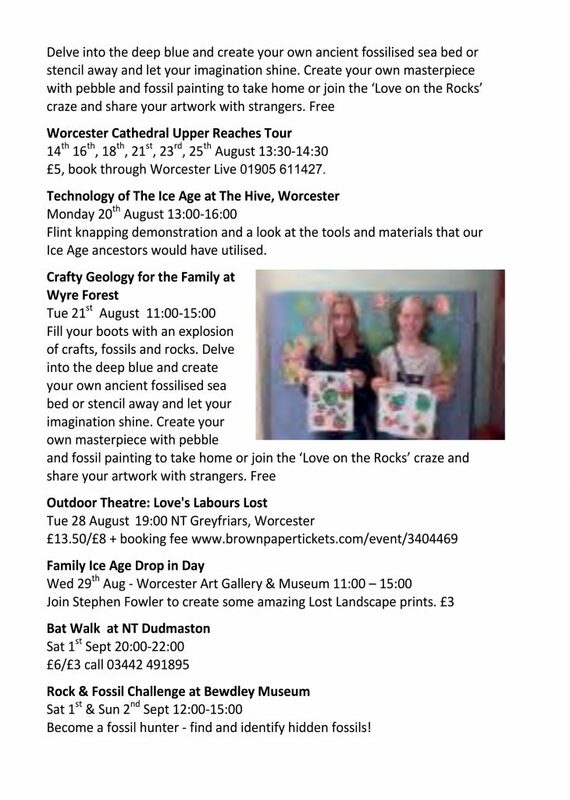 Join Worcester City Museum and the ‘Geologist in the Geopark’ to explore the museums wonderful geology collection. 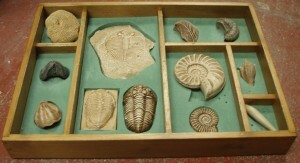 This will be an opportunity for you to discover, draw and handle these amazing and ancient specimens. This year’s exhibition involves collaborative work with Bewdley School and Sixth Form Centre and members of the Abberley and Malvern Hill Geopark. 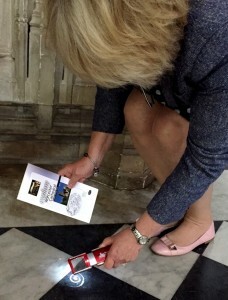 During the project local geologists offered their expertise to help the learners to identify the stone used in the building of some of the important historic structures in Bewdley. For more infomation about the project click here. 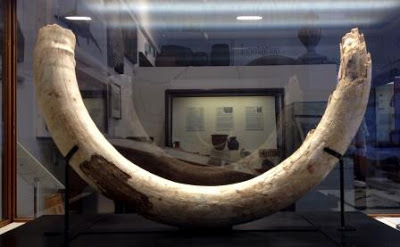 The exhibition runs from 12th September to 31st October at Bewdley Museum, 10am – 4.30pm. 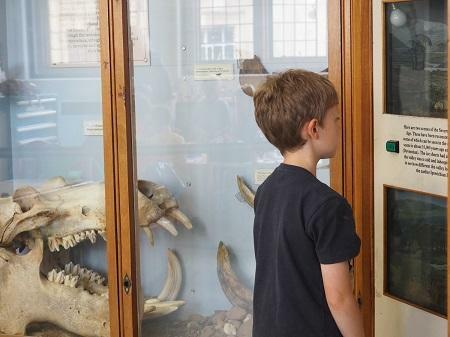 Admission to the museum is free! 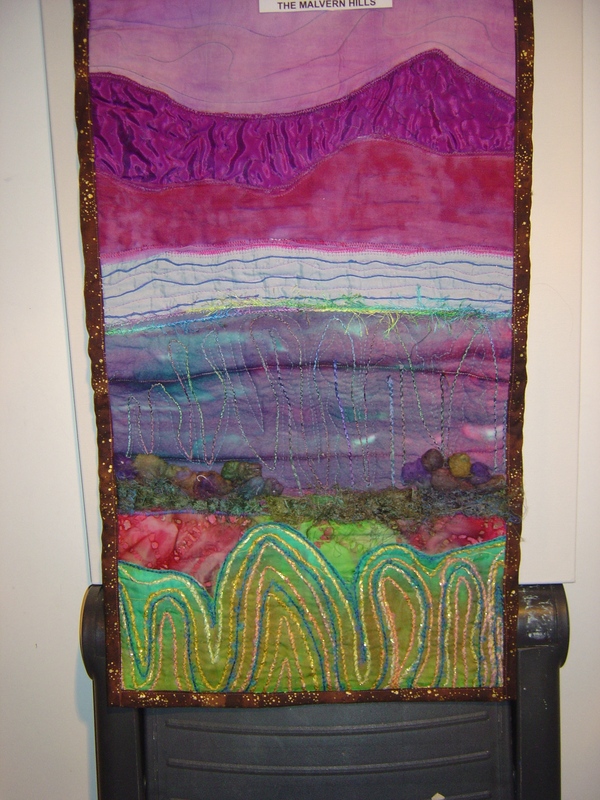 Shropshire Council rangers at Severn Valley Country Park are delighted to be welcoming Georgia Jacobs for this fascinating look at the use of geology in textile art. 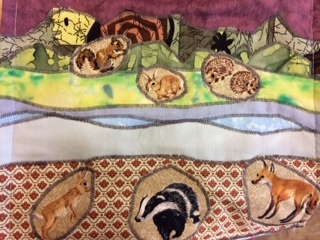 Since retiring from her career as a lecturer in Geography and Geology at Halesowen College, Georgia has been able to develop her love for textile art by gaining a series of qualifications including machine embroidery, silk painting and advanced textile decoration. 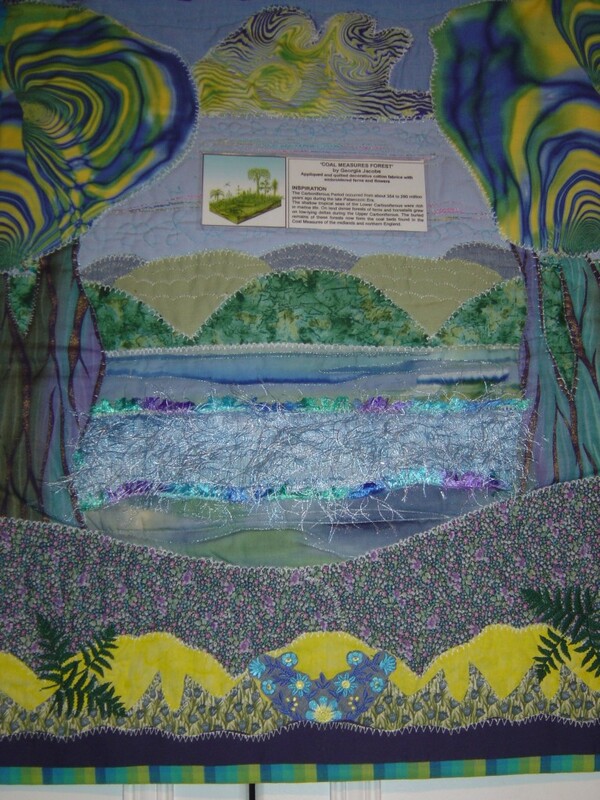 As a registered speaker on recreational geology and textile art for the Worcestershire WI, Georgia enjoys exhibiting her textile art as it helps promote public awareness of geology and how the subject can be used as a source of inspiration for artists working in textiles and mixed media. 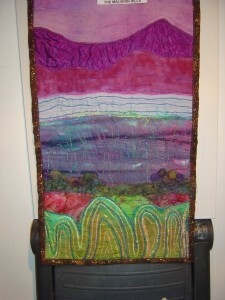 Georgia’s passion for textile art can be seem in her vast collection of vibrantly coloured, geologically inspired textiles. 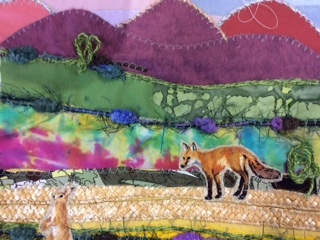 Her use of different textures and colours to create wonderful shapes and landscapes is very creative and she is able to bring the subject to life through this humorous and interesting talk. The talk will be held in the visitor centre on Thursday 15th October 7.30pm-9pm. Tickets are £3 Adults, £2 Children. Tickets include a hot drink and biscuits. Places are limited so please call 01746 781192 to book.